Yigal Amir was a right wing Israeli religious activist who assassinated Prime Minister Yitzhak Rabin. Amir served in a religious platoon, and even among his comrades, he was known as a religious fanatic. He was active in organizing support for Israeli settlers, and helped found an illegal settlement outpost. He was especially active in Hebron, where he led marches through the streets. Amir was heavily opposed to the Oslo Accord which was an attempt in 1993 to set up a framework that would lead to the resolution of the ongoing Israeli–Palestinian conflict. It was the first face-to-face agreement between the government of Israel and the PLO and Israeli Prime Minister Rabin was actively involved. The extraordinary power of the Sun / Neptune opposition along the vertical axis of the chart says a lot about his views and his actions. Neptune rules the religious impulse but when its aspects are difficult, this can easily turn to delusion, religious obsession and fanaticism. The Sun in the 4th house ( one’s roots and psychological foundation ) closely opposite Neptune is an appropriate symbol for a conservative form of religious fundamentalism. As Neptune is conjunct the Midheaven, it’s also easy to see Amir’s role in the undermining ( Neptune ) of the authorities or Head of State ( Midheaven ). A violent streak is suggested by the square aspect between Mars and Pluto and the assassination is evident in the Tsqaure between the Moon, Venus and Uranus. The Moon in Capricorn in the 11th house of political ideals shows someone with an instinctively conservative, even reactionary view of the world and opposite Venus in Cancer a great concern for the security of his homeland. The tension generated by this opposition focuses strongly by T Square onto Uranus in the 8th house. Uranus with difficult aspects produces sudden disruptive and rebellious events, the 8th house is the traditional house of death. This T square combined with the Sun / Neptune / Midheaven combination clearly points to the murder of a head of state fuelled by religious fanaticism and reactionary politics. Yitzhak Rabin was a Piscean. Pisces is not a sign that seeks conflict, it is much more concerned with the dissolving the ego and losing the sense of separation that individuals experience. In many ways, a Piscean would be the ideal person to bring together the Israelis and the PLO. Rabin also had a close conjunction between the Sun and Uranus showing an unconventional person with unorthodox and reformist ideas. He was no pushover as he had the Moon in Aries and Leo rising, but the Sun and Uranus conjunct in Pisces and Neptune rising suggests a leader with a peaceful agenda. Rabin’s T Square, however points to his fate. The Moon is in the 8th house ( of death ) and is opposite Saturn, the planet of restriction and frustration. This opposition focuses all of its energy by T Square onto Pluto ( sudden death ) in 11th house ( at the hands of a political … ) in Cancer ( reactionary who was concerned about his homeland ). A comparison of the two charts locks their karma together. Amir’s T Square is strongly aspected to Rabin’s. Amir’s Moon is exactly opposite Rabin’s Pluto, each of the pair creates a Grand Cross in the chart of the other. A Grand Cross is an aspect of extreme difficulty, where 4 or more planets are pulling strongly in 4 different directions creating a tension that demands resolution through dramatic action. 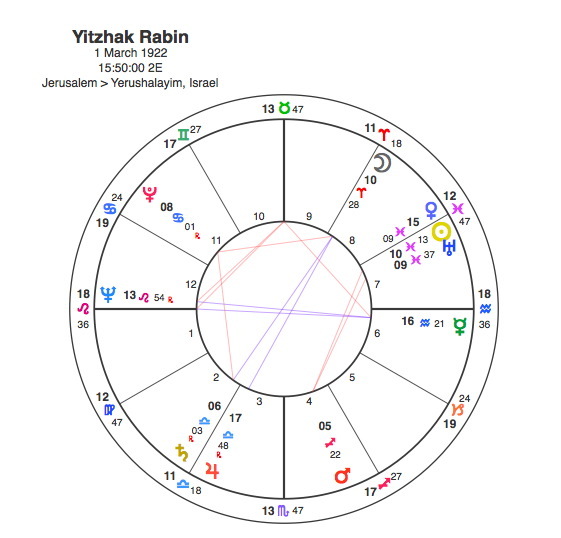 Amir’s Capricorn Moon in the 11th house ( his ultra conservative political instincts ) is the thing that causes Rabin’s death as a political assassination ( Pluto in the 11th house ). The timing of the assassination ineitably was down to Pluto. In 1994, Amir began a relationship with Nava Holtzman, her parents objected due to Amir’s Mizrahi background and in 1995 she married one of his friends. Amir went into a deep depression. In November 1995, Amir assassinated Yitzhak Rabin and was sentenced to life imprisonment. Pluto was opposite Amir’s Sun, conjunct the Midheaven and Neptune in 1995, the major transit of Amir’s life and a dramatic turning point for him but also for Yitzhak Rabin and the whole of Israel. It could well be argued that no Israeli leader since has been so open to dialogue with the Palestinians and so the progress that had been made was lost as a result of the assassination. In many ways this single act was a symbolic trigger for all of the traumas that followed throughout the world which are now referred to as the War on Terror. Astrology deals in the symbolic, it does not simply work through cause and effect, one thing leading to another, it works through symbolic themes. If a particular planet is prominent at any one time it means that the energy of that planet will be dominant and things that resonate with that planet’s symbolism will tend to occur. Of course we can look at the causes of events but why does one cause have a particular effect rather than any other. How can one man’s crazy actions have a global effect ? There is chaos theory with the often quoted idea that a butterfly flapping its wings in South America can cause an earthquake in Japan. Astrology is the opposite to chaos, it implies order although it may be an order that is difficult to comprehend. It is an order of symbolism. Astrology can help us understand the links between apparently unconnected actions. In Amir’s chart Pluto’s transit to conjunct the Midheaven clearly points to the assassination of Rabin. The Midheaven is 0 degrees 35 minutes Sagittarius. Pluto has just moved into Sagittarius and this assassination is probably its first major world event whilst in this sign. Pluto moves very slowly and its presence in a particular sign shows an area in global experience that is due for great prominence and tremendous upheavals. Because Pluto rules change and transformation, death and rebirth it’s sign placing often reveals where humans see their enemies. Pluto is an energy that everyone finds difficult to absorb because we all want to cling to the familiar, so we see its presence as a destructive force. It can often work very destructively because it has to dramatically clear the ground of old experience in order to start something completely new. Pluto was in Scorpio from 1983 to 95, the theme for this was the end of the Cold War and the dismantling of the Soviet State ( Russia has the Sun in Scorpio ). As Pluto travels through a sign there is often one single action that brings all of this into focus and dramatically changes global thinking around the particular symbolic theme. The particular symbolic single event for Pluto in Scorpio was the Fall of the Berlin Wall in 1989. In 1983 as the Pluto in Scorpio period began, US President Ronald Reagan was sounding off about the Evil Empire and with the Soviet leadership position in upheaval, two years before Gorbachev arrived, many people thought that nuclear confrontation was inevitable. By 1995, the changes that had occurred were astounding and the Russians were no longer seen as the enemy. The perceived enemies had to come from another quarter. Pluto was in Sagittarius from 1995 to 2008, Sagittarius has rulership over religion and so the enemies of this period had to be religious fundamentalists. The single event for Pluto in Sagittarius was obviously 9/11 which occurred in 2001. As Pluto changes signs it has to start actions that move the emphasis towards the theme of the period. So what better way than to bump off Yitzhak Rabin, a political figure that was leading the movement towards peace in the Middle East ? So in many ways we can look at Yigal Amir as un unwitting pawn in Pluto’s grand plan. The assassination had to occur along with many other events to help pave the way for 9 / 11 and the War on Terror. 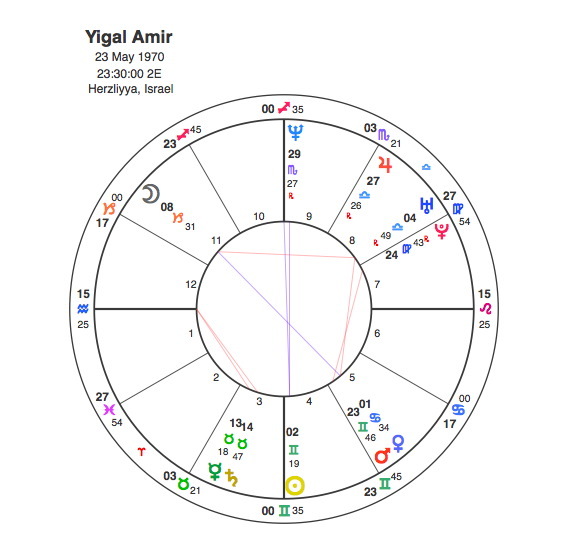 Yigal Amir was Pluto’s assassin and helped to usher in the Sagittarian era and a level of tension in the Middle East that had been unheard of up to that point.